DIE Veneris, 11 die Octobris. Ld Privy Seal Speaker by Commission. Thanks to the King, for His Speech. 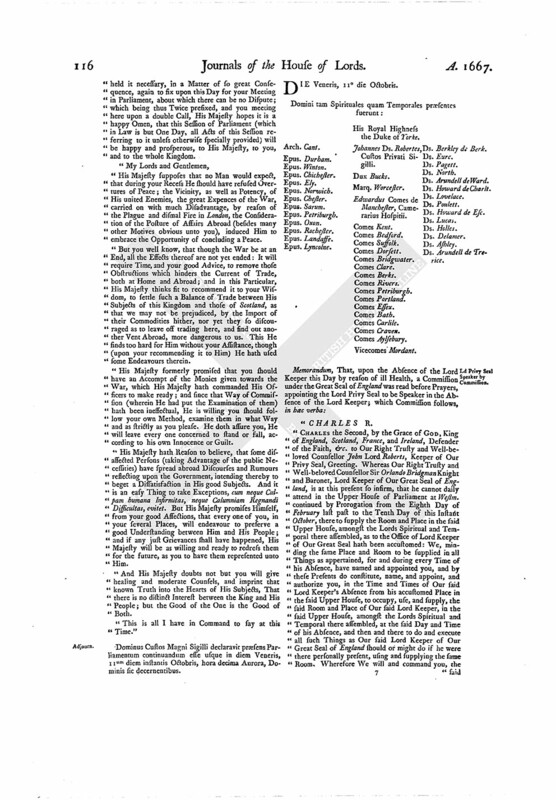 E. of Rochester, Writ of Summons under Age. Epus. Lyncolne. Johannes Ds. Robertes, Custos Privati Sigilli. Edwardus Comes de Manchester, Camerarius Hospitii. Vicecomes Mordant. Ds. Berkley de Berk. "Charles the Second, by the Grace of GOD, King of England, Scotland, France, and Ireland, Defender of the Faith, &c. to Our Right Trusty and Well-beloved Counsellor John Lord Roberts, Keeper of Our Privy Seal, Greeting. Whereas Our Right Trusty and Well-beloved Counsellor Sir Orlando Bridgman Knight and Baronet, Lord Keeper of Our Great Seal of England, is at this present so infirm, that he cannot daily attend in the Upper House of Parliament at Westm. continued by Prorogation from the Eighth Day of February last past to the Tenth Day of this Instant October, there to supply the Room and Place in the said Upper House, amongst the Lords Spiritual and Temporal there assembled, as to the Office of Lord Keeper of Our Great Seal hath been accustomed: We, minding the same Place and Room to be supplied in all Things as appertained, for and during every Time of his Absence, have named and appointed you, and by these Presents do constitute, name, and appoint, and authorize you, in the Time and Times of Our said Lord Keeper's Absence from his accustomed Place in the said Upper House, to occupy, use, and supply, the said Room and Place of Our said Lord Keeper, in the said Upper House, amongst the Lords Spiritual and Temporal there assembled, at the said Day and Time of his Absence, and then and there to do and execute all such Things as Our said Lord Keeper of Our Great Seal of England should or might do if he were there personally present, using and supplying the same Room. Wherefore We will and command you, the said John Lord Roberts, to attend to the Doing and Execution of the Premises with Effect. And these Our Letters Patents shall be your sufficient Warrant and Discharge for the same. In Witness whereof, We have caused these Our Letters to be made Patents. "Witness Ourself at Westm. the Eleventh Day of October, in the Nineteenth Year of Our Reign. "Per ipsum Regem propria Manu signat." ORDERED, That the humble Thanks of this House be presented to His Majesty, for His Gracious Speech, and that of the Lord Keeper's by His Appointment; and that His Majesty would be pleased to give Order for the Printing and Publishing of them both; and that the Marquis of Worcester, the Lord Chamberlain, the Earl of Bridgwater, the Earl of Dorsett, the Earl of Aylsebury, the Bishop of Winton, the Bishop of Chichester, the Lord Pagett, the Lord Ashley, and the Lord Arundell of Trerice, are appointed a Committee, to attend His Majesty, this Afternoon, at Three of the Clock, at Whitehall, for that Purpose. Epus. Lyncolne. Ds. Berkley de Berk. Their Lordships, or any Seven of them; to meet on Monday next, in the Afternoon, at Three of the Clock, and afterwards every Monday; and to adjourn themselves to such other Times as their Lordships shall think fit. Epus. Rochester. Ds. Berkley de Berk. Their Lordships, or any Three of them; to meet on Saturday next, at Three of the Clock in the Afternoon; and afterwards every Saturday, and at such other Times as they shall think fit. Their Lordships, or any Five; to meet in the Painted Chamber, every Tuesday, at Three of the Clock in the Afternoon; and to adjourn themselves to such other Times as they shall think fit. 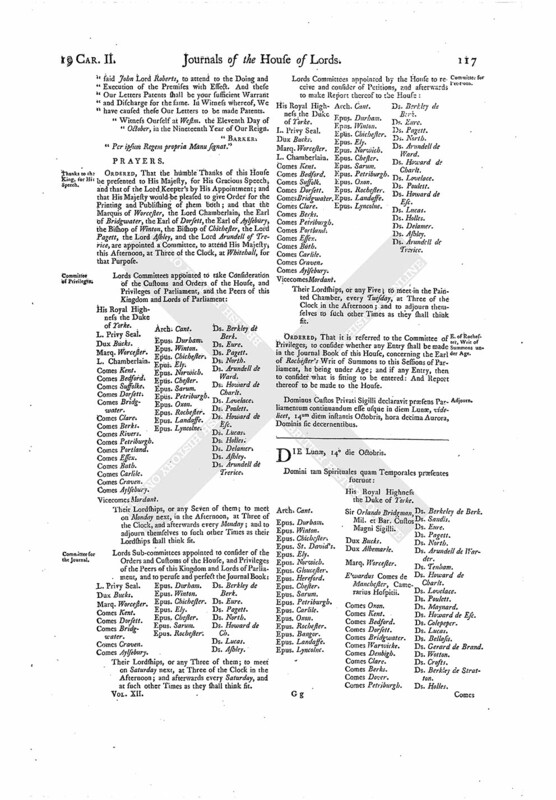 ORDERED, That it is referred to the Committee of Privileges, to consider whether any Entry shall be made in the Journal Book of this House, concerning the Earl of Rochester's Writ of Summons to this Sessions of Parliament, he being under Age; and if any Entry, then to consider what is fitting to be entered: And Report thereof to be made to the House. Dominus Custos Privati Sigilli declaravit præsens Parliamentum continuandum esse usque in diem Lunæ, videlicet, 14um diem instantis Octobris, hora decima Aurora, Dominis sic decernentibus.